Fragrance of dating and love, romantic and sensual, elixir of good mood! The perfume aims at all those who enjoy infatuation, love, unity, fulfillment. The new fragrance by Lanvin was created with an intention to suggest a strong bond that each woman has with the perfume she chooses. which follows her like a shadow and says a lot about her emotional state. Lanvin Marry Me is presented with a floral composition as optimistic as a cheerful smile. Advertising campaign presents two people in love. They have just met and we don't know if their story will last. It is important to know that life is beautiful and easy at this moment. The composition is based on luminous tonic mixed of bitter Tunisian orange and sensual essences of Sambac jasmine. This surprising combination is wrapped in sweet zest of peach and sophisticated jasmine tea aromas. A sensual heart is painted with jasmine enhanced with magnolia blossom and romantic, non-chalant rose petals. Union of white flowers and fruit zest melts in juiciness and warmth of powerful hot amber and musky trail. 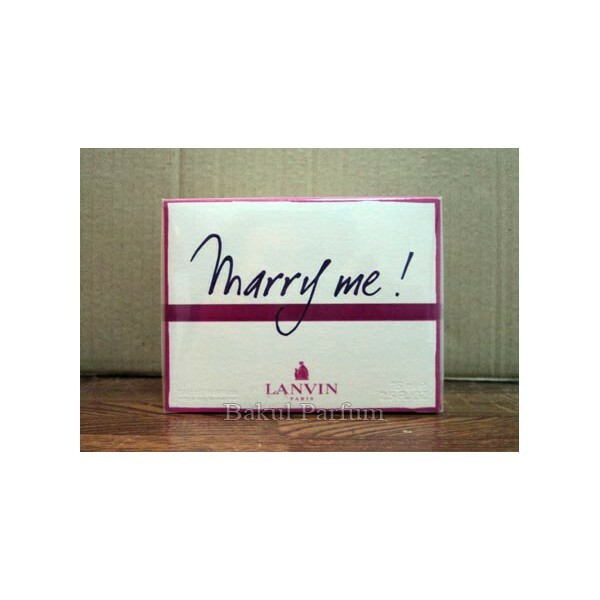 Beli parfum original Lanvin Marry Me for Women sekarang, harga termurah di Indonesia! !